Some of the earliest traces of human history in this (the Quercy) region of France can be found in the Grotte du Pech Merle-- astonishing artistic impressions from millennia past where you can enter the emotional and feral word of the cave dwellers: pointillated horses, bison, mammoths, aurochs, and mysterious images that still evoke wide and wild interpretation. Historically, St. Cirq was a stronghold of the Viscounts of Quercy, the heads of the powerful governing families - the Lapopies, the Gourdons, the Cardaillacs and, by some counts, the Castelnaus. In times of conflict, this site was strategically important, with its main fortress located on a bluff overlooking the river. Below the fortress, the village streets were closed off for security by fortified gates. In 1198 the fortress failed to be taken by Richard the Lionheart (Coeur de Lion!). And the English, in the 100 Years War were also unable to take it. During the wars between England and France in the middle of the 13th century, southern Quercy was ceded to England by Henri II and in the middle of the 16th century it was the bastion of Protestants and the scene of brutal religious warfare. Louis XI decreed that the fortress be demolished but the remnants continued to be of strategic importance during the Wars of Religion. Henry of Navarre (later King Henry IV) had the remaining walls pulled down in 1580. The Gothic church of Saint Cirq, dedicated to St Cyr and his mother St Julitte, was built beginning in 1522, incorporating sections of the earlier Romanesque parish church. It retains vestiges of the 12th century acanthus leaf decoration, as well as fragments of 13th century wall paintings. The beautiful stone and colombage (half-timbered) houses which line the steep winding streets of St. Cirq Lapopie, date from the 13th through 16th centuries, thirteen of which (including the maison, Coeur de Lion) are listed in France's historical register. The arterial locks of the Lot river, constructed in the 17th century, allowed the village to prosper commercially. Garbarres (flat bottomed boats) transported local produce, tobacco and wine to Cahors and Bordeaux. Coppersmiths, tanners and wood turners made their living within the village gates. Today, the narrow thoroughfares, with open arcades of shops, preserve the memory of these craftsmen whose work helped create the wealth of Saint-Cirq. The wood turners or "roubinetaïres" were especially prominent, their workshops producing all manner of household products including moulds, buttons, bowls, cups, barrels, taps and valves. In fact, the local wood turners collectively invented the wooden taps for wine barrels, without which the burgeoning wine industry would have suffered a dire fate. The medieval village is spread out beneath the castles and towers, perched on one of the highest cliffs in the Lot valley. Boasting a population of 1,090 in 1793, when records began, fewer than 300 people reside in the village today. During the middle of the 20th century, the impressionist artist, Henri Martin and the Catalan artist, Pierre Daura lived in St. Cirq, as well as the surrealist writer, André Breton. 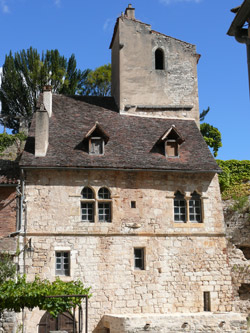 The most famous of the artists drawn to the beauty of Saint-Cirq-Lapopie is the writer Andre Breton, whose house sits just below the great Gothic church. Inspired by the Dada movement (with Tristan Tzara), Andre Breton moved beyond that period in leading the Surrealist movement. He wrote the "Manifesto of Surrealism" in 1924, offering a definition of a new poetic and artistic license, liberated from received styles, promoting 'pure psychic automatism by which one proposes to express, either verbally or otherwise, the actual functioning of thought, dictated by thought, in the absence of any control exercised by reason, outside of any aesthetic or moral concern." The Spanish-born artist, Pierre Daura, studied in Barcelona and made his career in Virginia, painting landscapes. He lived in Saint-Cirq-Lapopie from 1930 to 1939 and every summer thereafter until his death in 1976. His daughter, Martha Daura, wanted the family houses to be committed to the arts as they had been in her father's lifetime. Les Maisons Daura are now residences for artists from around the world, all dedicated to contemporary work, managed by the Georges Pompidou Maison des Artes in nearby Cajarc. It was restored in 2005 and remains a research center for artistic innovation. Once a typical family house on a cobbled street at the foot of the church, the Rignault Museum houses a fascinating trove of historical items, puts on a variety of artistic and historical exhibits, and offers a beautiful garden with breathtaking views for a lovely respite from the hilly hikes. Please click on the links above to see and read more of the village's fascinating history.